Dr. Donald Kerr, Special Collections Librarian at the University of Otago has taken on the task of tracking down all known copies of the tapa cloth books from Captain Cook's three voyages. Some of you may remember the post on 1 June 2012, which discussed this book and the specimen in the Sir George Grey Special Collections at Central City Library. The full title of the book is as follows: 'A catalogue of the different specimens of cloth collected in the three voyages of Captain Cook, to the Southern Hemisphere: with a particular account of the manner of the manufacturing the same in various Islands of the South Seas; partly extracted from Mr. Anderson and Reinhold Forster's observations, and the verbal account of some of the most knowing of the navigators: with some anecdotes that happened to them among the natives'. London: Arranged and printed for Alexander Shaw, 1787. 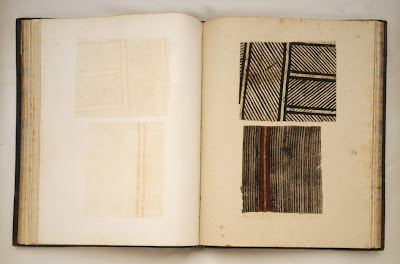 ﻿According to Dr Kerr, the tapa cloth book usually contains: a letterpress title, dedication on verso, 6 pages text and specimens of tapa cloth on (usually) 24 leaves. However, specimens vary in size and number; two institutions record as much as 56 and 92 leaves. Initially 30 copies of Shaw's catalogue were known to have survived, but a more recent estimate by Ian Morrison (see article below) gives a figure of 45, held in institutions world-wide. However, a rather more recent reckoning has pushed this number to 47. This does not take into account various copies (five so far), that have been offered up by antiquarian dealers (in parts or whole). Dr Kerr intends to contact those institutions known to have copies, as listed in the bibliographies and sourced articles. He is also keen for any other institutions or individuals to contact him about any other copies out there. Whilst Dr Kerr does intend to carry out a full descriptive census of the tapa cloth books himself, the work of tracking down institutions with copies would definitely help a future researcher to undertake the job of examining all copies in detail. What a great project! Louise Wilson, 'An investigation into the origin of the Tapa specimens collected by Captain Cook on his three voyages to the Pacific' in Bulletin (Bibliographical Society of Australia and New Zealand), v.27, no.3-4, 2003, pp.60-70.